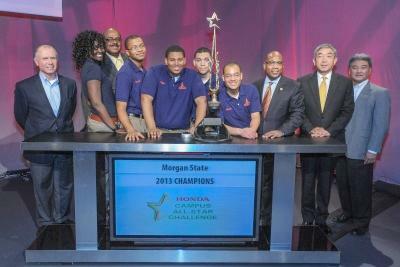 The team from Morgan State University celebrates on stage after winning their second consecutive title at the 2013 Honda Campus All-Star Challenge. After two days of intense competition among 250 students representing 48 competing teams, Morgan State University claimed its second National Championship title in a row at the 24th Annual Honda Campus All-Star Challenge (HCASC), an annual academic event featuring the best and brightest students from the nation’s Historically Black Colleges and Universities (HBCUs). Enduring a year-long program of study and preparation, the Morgan State University team emerged victorious at the National Championship Tournament held on the Los Angeles-area campus of American Honda Motor Co., Inc., and took home $50,000 in grants for their school. The Morgan State University team included Craig Cornish (Captain), senior, History Major; Kyle De Jan, senior, History Major; Micheal Osikomaiya, junior, English Major; and James Hayes-Barber, sophomore, Electrical Engineering Major. The fast-paced, suspenseful competition tested the students’ abilities to quickly and accurately answer questions on a broad range of topics including world history, science, literature, religion, art, social sciences, popular culture and African-American history and culture. The top two teams from each of the eight competing divisions advanced to the “Sweet 16,” a single-elimination playoff. The final two teams then battled it out for the national title in a best 2-out-of-3 finals. While Morgan State University secured the top prize of $50,000 in university grants, all 48 schools were awarded grants. Florida A&M University won $25,000, while the remaining “Final 4” teams – Oakwood University and West Virginia State University – each received $15,000. The other top eight – Alabama State University, Clark Atlanta University, Morehouse College and North Carolina A&T University – were awarded $9,500 in grants. In total, Honda provided more than $300,000 in grants to participating schools. Since 1989, HCASC has brought together the nation’s best and brightest academic competitors from America’s top HBCUs. Throughout its history, HCASC has been the only annual academic competition between the nation’s HBCUs, touching more than 100,000 students and awarding more than $7 million dollars in grants. – Steve Morikawa, assistant vice president, Corporate Community Relations, American Honda Motor Co., Inc.
For photos and more information on this year’s Honda Campus All-Star Challenge, please visithttp://www.epklink.com/HCASC2013 and www.HCASC.com.